You Wu (BSME ’11) has been named to Forbes 30 Under 30 list for Manufacturing & Industry, recognizing the best and brightest innovators under 30 years old. 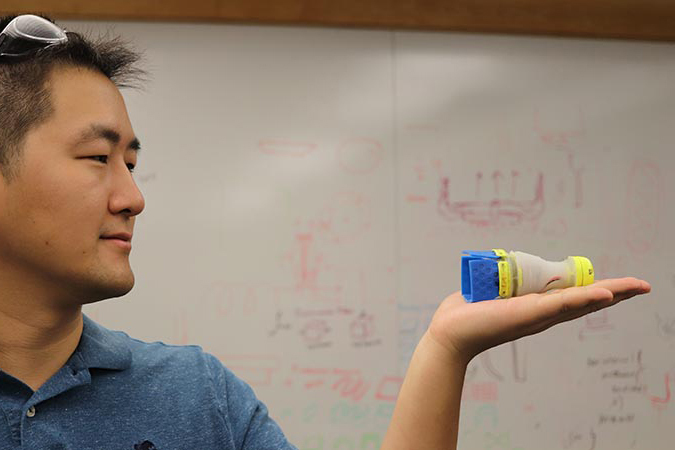 Wu’s company, Pipeguard Robotics, manufactures a shuttlecock-shaped robot called “Daisy” that travels through water pipes to detect leaks. Its sensors can detect minute suction forces that indicate water leaks. It also links with mapping software, so engineers can see exactly where leaks are occurring. It’s an elegant solution to a big problem — over 20% of the world’s clean water is lost to pipe leaks. Pipeguard is contracted with Wise County, Virginia; the Lingang Industrial Zone in Shanghai; and Monterrey, Mexico. While getting his bachelors at Purdue Mechanical Engineering, Wu was president of Pi Tau Sigma, and was a project lead for Purdue Solar Racing. He also worked with Karthik Ramani’s C Design Lab. Wu developed the Daisy robot at MIT. You Wu holds “Daisy” in his hand.